Hegel makes philosophical proposals concerning religion and Christianity that demand critical reflection from contemporary theology. Possible defences and criticisms are given in Hegelian discourse, which raise important questions in current theological inquiry. ^^^This religious enquiry runs through publications and writings produced during the development of Hegel's systematic philosophy. De Nys considers the understanding of religion and Christianity that Hegel develops in the Phenomenology of Spirit. The discussion of religious involvement gives special attention to questions concerning religious discourse, which Hegel addresses in his treatment of representational thinking, including Hegel's critique of Schleiermacher. ^^^This leads to a discussion of the problem of the relation between the world and God and the issue of God's transcendence, which requires further analysis of the relation of representational and speculative thinking. These discussions provide a framework for considering Hegel's understandings of specific Christian mysteries. The Hegelian conception of the Trinity, the mysteries of Creation, Incarnation and reconciled indwelling are considered in connection with biblical conceptions of the Trinity. 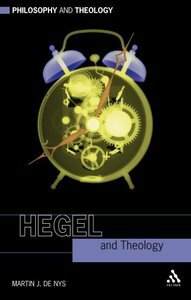 ^^The conclusion examines critical problems surrounding Hegel's essential proposals about religion and Christianity, as well as contributions that Hegel makes to, and the challenges his thinking poses to, contemporary theological inquiry. Throughout, the discussions emphasize an understanding of Hegel's views concerning religion and Christianity as a resource for critical reflection in contemporary theology. About "Hegel and Theology (Philosophy And Theology Series)"
Hegel makes philosophical proposals concerning religion and Christianity that demand critical reflection from contemporary theology.Hegel and Theology discusses the role that an understanding of religion and Christianity play in the development of Hegel's idea of philosophy; Hegel's treatment of religious experience; the problem of the relation between the world and God and the issue of God's transcendence. These discussions provide a framework for considering Hegel's understandings of specific Christian mysteries. De Nys here considers the Hegelian conception of the Trinity, and the mysteries of Creation, Incarnation, and reconciled indwelling in connection with the persons of the Trinity.Hegel and Theology concludes by examining critical problems that belong in an immanent way to Hegel's essential proposals about religion and Christianity, as well as contributions that Hegel makes to contemporary theological inquiry. Martin J. De Nys (Ph.D., Loyola University) is Associate Professor of Philosophy at George Mason University, Virginia, U.S.A. His research interests include 19th and 20th century Continental philosophy, especially Hegel and Marx, philosophical theology, political philosophy, and ontology. He has written Hegel and Theology for the Philosophy and Theology series. Preface; Introduction; Chapter One. Hegel's Idea Of Knowledge And Philosophy; Chapter Two. Religion And Christianity In The Phenomenology Of Spirit. ; Chapter Three. Philosophy, Religion, And Theology. ; Chapter Four. The Problem Of God And The World In Christian And Hegelian Thought. ; Chapter Five. The Christian Mysteries. ; Chapter Six. Hegel's Legacy: The Problem. ; Chapter Seven. Hegel's Legacy: The Promise; Bibliography.